MacGregor, part of Cargotec, has announced that the first units of a 672-strong MacRack orderbook are now being installed. The units are destined for a total of 38 ships for various owners; 35 of which are for 180,000dwt bulk carriers and the remaining three are for 87,000dwt bulkers. Each of the larger vessels will be fitted with 18 MacRack units and the smaller vessels will each feature 14 units. MacRack is an economical, competitive and environmentally friendly electric-drive system for side-rolling hatch covers. “Current levels of interest in MacRack systems strengthen our firm belief that they will become the standard system for side-rolling hatch covers,” says Torbjörn Dahl, senior naval architect for bulk ships at MacGregor. MacRack uses variable frequency drive (VFD) technology, which delivers high torque with low speed and allows for the optimized use of electric power. “MacRack units deliver a number of advantages,” adds Dahl. 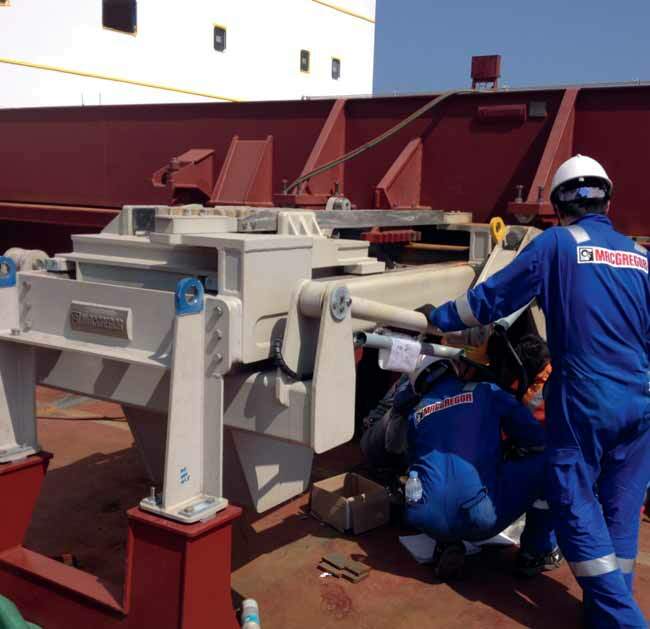 “They unite the ‘lift’ and ‘drive’ operations and so make separate hatch cover lifters obsolete.This reduces maintenance work for the shipowner, and the shipyard’s installation work is also simpler because fewer components need to be installed on the coaming. “Also, unlike hydraulic pump units, there is no continuous running of motors and there is no need to warm the oil in advance, so MacRack delivers energy savings and is also not as sensitive to a cold climate as hydraulic systems,” adds Dahl. MacGregor offers world leading engineering solutions and services for handling marine cargoes and offshore loads. The scope of its integrated packages is growing and now also includes Hatlapa, Porsgrunn, Pusnes and Triplex products. MacGregor serves the offshore, maritime transportation and naval logistics markets in ports and terminals as well as on board ships and rigs. MacGregor solutions combine load and cargo access, stowage, care and handling functions to optimize lifetime profitability, productivity and environmental sustainability. MacGregor is part of Cargotec. Cargotec’s sales totalled approximately €3.2 billion in 2013 and it employs approximately 11,000 people.